LUANDA, Jul 8 2009 (IPS) - The fourth largest river in Africa, the mighty Zambezi, is a lifeblood to 32 million people, from land-locked Zambia to Mozambique on the Indian Ocean. But its blessing is also its curse. Climate change is blamed for an increase in rainfall and flooding along the river's 2,574 kilometre course through Angola, Zambia, Botswana, Namibia, Zimbabwe and Mozambique. In recent years, hundreds of thousands have lost their homes, livestock and livelihoods, leading to severe food insecurity, an increase in water-borne diseases and long-term environmental degradation in an area already steeped in high levels of HIV and associated poverty. The start of 2009 saw some of the worst flooding in the area's history. In Namibia more than 100 people were killed, 55,000 displaced and more than 350,000 lost their livelihoods prompting the government to declare the floods a "national disaster". In Zambia, where annual rainfall has risen from 900 mm to 1,300 mm in recent years, communities who used to be able to judge when to vacate the flood plains each year are now being caught out. This year, tens of thousands have been left homeless, and the floods, which have destroyed harvests, are being described as the worst in 150 years. And in Angola, still recovering from a three-decade-long civil war which ended in 2002, more than 222,000 families were left homeless by flooding which swept away houses, sank roads, ruined 228 hectares of crops and killed thousands of goats, cows and livestock. 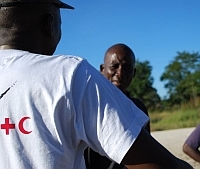 A British Red Cross team dispatched to Moxico province in the southwest of Angola found people living in a desperate situation with little access to food, medical supplies and having lost all their crops due to flooding and with little hope of getting back on their feet without external assistance. Linda Hitchcox told IPS: "This is a province still very affected by the war. It's a wild environment, people living gathering and subsistence existences, relying on basic fishing just to get through each day. Now they have lost their homes, their livelihoods and their livestock. "It's not that people don't know it's dangerous to live by the river, of course they do, but they choose to live there because their livelihood is so vulnerable. They need to be close to the fertile soil to grow food and be close to water to fish." As monitored in Zambia for example, traditional rain and dry season cycles, are no longer predictable and existing community warning systems are no longer enough to protect those living in the Zambezi basin area. In a bid to address the impact of climate change and its effects on these communities, the International Federation of Red Cross (IFRC) and Red Crescent Societies have created the cross-border Zambezi River Basin Initiative (ZRBI). Conceived in 2008 and launched last month, the ZRBI aims to bring long-term disaster management to the region. The initiative will include the six countries where the Zambezi runs, plus Malawi, whose Shire River, one of the Zambezi's largest tributaries, is regularly subject to backflow and subsequent flooding. A similar cross-border initiative involving Kenya, Uganda and Tanzanian Red Cross Societies has been tried and tested since 2003 on the shores of Lake Victoria in East Africa. "In recent years, we have witnessed a dramatic increase in the numbers of floods along the river basin," explained Farid Abdulkadir, the IFRC's disaster management coordinator for the Southern Africa region. "For many communities, these events are now annual crises – leaving them in an almost perpetual cycle of disaster, displacement and recovery. "The Zambezi Initiative aims to break this cycle; to help communities be prepared for these disasters, and to encourage them to take steps to reduce the devastating impact that they have on their lives." One strand of the initiative is longer-term planning, the implementation of robust early warning systems, and creating a more integrated approach across the region between Red Cross volunteers and branches. Karen Hvid, IFRC's Angola representative, said: "The important thing is to give the communities tools to be able to react in time to the hazards and how they react in those first 48 hours before help can arrive. "If a community knows its vulnerabilities and its capacity, it can learn to support itself." She added that even basic tools such as drums and coloured flags can help people communicate risk and save lives. Surveys carried out by Red Cross branches in the area found flooding and subsequent displacement and loss of harvest had led to extreme health, social, economic and psychological vulnerabilities. These were due to a number of factors including a lack of safe water supplies and sanitation facilities, stagnant water increasing water-borne diseases like cholera and mosquito breeding leading to more malaria, dependency on maize with limited alternative sources of income, food insecurity, high levels of HIV and AIDS, a large number of women-led households and even hippo and crocodile invasion due to increased water levels. The idea is to address these issues together, not in isolation, and before, not after the floods have struck each year. It begins with the creation of community hazard maps to understand risks better, disaster management to know how to react when it floods and health and sanitation training to reduce disease spread from high water levels. Then there is the better post-harvest food storage for the crops that do survive, advice on soil maintenance, seed nurseries, crop diversification and nutritional training. Environmental consideration is also key, and the idea is to work to prevent long-term degradation of the area by promoting tree planting to reduce deforestation and subsequent soil erosion. The ZRBI aims to directly benefit 235,800 people over a three-year period – mostly women and children. A further 464,000 people who live nearby the most-affected districts are also expected to gain indirectly from a programme of training in early warning systems, disaster preparation, and malaria and HIV prevention measures taking the scope to 700,000. Such initiatives don’t come cheap of course, and the IFRC is appealing for close to eight million dollars to fund its work. It claims that aid money buys four times as much humanitarian impact if spent before a disaster rather than on a knee-jerk relief operation. It also hopes that one day the Zambezi can fulfil its potential for tourism, arts and crafts, cultural exchange, cross-border trade, electricity generation and environmental conservation.